Bankers Insurance Company has been in the bail surety business for over 35 years. Through Bankers and its sister company First Community Insurance Company, we are currently licensed to write bail bonds in 42 states. Our philosophy is simple: Profit through Partnerships. We value the personal relationships we have with each of our bail agents, and appreciate their feedback and input. Our achievements are 100% dependent on the success of our agents. We strive to provide the most reliable and efficient service to our customers. Please contact us at 800-627-0000 ext. 4104 to discuss becoming a partner with Bankers. Flat execution fee for transfer bonds, Excellent transfer bond coverage, Free bail tracking software for Bankers agents, and of course ease of doing business. 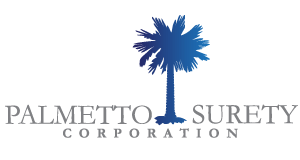 Palmetto Surety Corporation was licensed February 10, 2003, as the first surety insurance company domiciled in South Carolina. The company's primary function is to provide surety coverage in the form of bail bonding insurance through its agents. However, Palmetto Surety also provides much more to the local communities, counties, and to the state of South Carolina's economic growth and development. Palmetto Surety Corporation strives to advance the surety bond industry through exemplary customer service, professionalism, and integrity. This will be achieved by use of an innovative management structure, a streamline underwriting process, and by utilizing state of the art technology. Palmetto Surety is committed to our clients, surety agents, and the communities we serve. South Carolina, Florida, North Carolina, Tennessee, Connecticut, Louisiana, and Mississippi. We believe in people. We believe that the best way to predict the future is to create it. Combining the two has enabled us to become the largest bail bond underwriter in the country. Our success is a result of surrounding ourselves with bail bond agents of integrity, honesty and a vision for the future. The knowledge, education, and experience of our bail agent network is endless, thus the possibilities of our successes together are unlimited. We believe in teamwork where we all work together toward a common goal. Bail bond agent applicants can be assured that coverage areas are carefully selected to provide convenience to our clients and maintain existing bail agents' territories. We make it easy to do business with us. Annual Conference, Continuing Education, Co-op Advertising, Training. What is Bail Insurance? Why do I need it? Many states require bail agents to prove that they will be able to pay for forfeited bail bonds. Often times this is required in bond form. Bail insurance is essentially a large bond that shows the court a bail agent will be able to pay smaller bail amounts in full. Both new and experienced bail agents need bail insurance unless they have the monetary means to underwrite themselves and live in a state that allows bail agents to not be backed by an insurance company. Even if you have the monetary means to show the court you can back the bonds you write, it may be wise to have bail insurance. Many bail insurance providers provide additional benefits, such as a nationwide network of agents to work with. A surety is the actual insurance company backing bail agents. Some sureties have managing general agents or general agents that manage and interact with the bail agents directly. A general agent is a registered bail agent that oversees an insurance company's bail division. The general agent is responsible for communicating with, managing, and handling all the paperwork for the insurance company. Essentially, the general agent acts as a go-between for the insurance company and the bail agent. The general agent indemnifies the insurance company of liability in the case of forfeited bonds. Surety companies may use one large general agent or may choose to use smaller, regionally located general agents. What should I look for when choosing surety representation? When choosing surety representation, it is important to look at two factors: the contract rate and the value-added benefits. Essentially, how much will you be paying, and what will the surety or general agent do for you? Surety companies generally offer a suite of added benefits, such as discounts on agency management software or other corporate necessities, educational opportunities, and 24 hour support. Each surety or general agent will offer different benefits for working with them - be sure to inquire what benefits you will receive by working with a particular company. What is a typical contract rate? Typically, a surety or general agent will charge around 2% per $1,000 for each bond you write. The contract rate will vary, however, depending on the agent. Like car insurance, your rate can increase or decrease based on the number of years you have been in the bail industry, your forfeiture rate, how much supervision you require and more. A BUF, or a build-up-fund, is essentially a savings account kept by the surety company. The more money you have in your BUF, the lower your contract rate will be. Surety companies will take legal fees, recovery fees and more out of an agent's BUF if necessary. While surety companies hold the BUF in trust, the account belongs to the individual agent. As a general rule of thumb, 1% of each bond a bail agent writes is deposited into their BUF account. Are you an individual looking for a bail agent to get a loved one out of jail? If so, please visit our sister site, AboutBail.com to find a bail agent. BailInsurance.com is a resource that allows surety companies and agents to connect. We give new and experienced agents a resource to weigh the benefits offered by sureties who write in their state. What are their rates? Do they offer value-added services such as advertising, training or access technology. Bail Sureties are constantly looking to recruit the industries top agents. The information and services we offer attracts a steady pool of savvy, business-minded agents. How Does Bail Surety Works? Many states require bail agents to prove they are able to pay for forfeited bail bonds. A surety company is essentially an insurance company that will guarantee this. In most cases, surety companies will require a certain percentage of every bond written. A percentage of this goes to the surety company and a portion of that goes into a build up fund (or BUF), which helps pay for forfeited bonds. Many sureties also provide support and added value to help a bail agency run with ease, which is why it is important to find a surety company or general agent that is right for you. For more information about bail surety, visit our FAQs. BailInsurance.com is an AboutBail.com property. In our 10-plus years in the bail industry, new we've been asked countless times by bail agents "Which companies offer surety contracts in my state?" or "What are the best sureties to work with?" The answer to these questions is BailInsurance.com. Behind any good bail agent is a good surety company. On the surface, many surety companies may seem the same and appear to offer a similar product. However, when looking for a new contract provider, it is important to dig a little deeper and find the surety or general agent that offers the proper mix of service and value-added offerings that works for you. BailInsurance.com is here to help you do just that - with long-standing relationships with surety companies, BailInsurance.com connects bail agents with surety companies and general agents who meet their needs. At the same time, we offer surety companies a forum to recruit business-savvy and experience retail agents. © Copyright Bail Insurance. All rights reserved.